Malavika Kumar Walia is the daughter and student of Mythili Kumar. As a senior company dancer, choreographer, and teacher, she has been teaching, dancing and performing nattuvangam for arangetrams, solo recitals of Mythili & Rasika, and for company productions since 2000. In a 2004 performance in Chennai, she was lauded by a critic as ‘the star of the show’ for her ‘precise, well-intoned nattuvangam’. She has performed in many of Abhinaya Dance Company’s productions with key roles and has toured with the company to India and around the U.S.A. She also coaches students towards their Arangetrams (solo debut performances). She has also composed numerous jathis and choreographed items for solo and group performances. Anjana Dasu has been learning Bharatanatyam under Mythili Kumar for over ten years and performed her Arangetram in 2005. Since then and all through her undergraduate years, she has performed in several Abhinaya productions and toured with the company to New York, New Jersey, Los Angeles, Utah, St. Louis, Boston, and Indianapolis. Additionally she has danced with the company at the San Francisco Ethnic Dance Festival in 2007, 2008, 2010, and 2011. Critics have praised her as “exquisite” and “a nuanced dancer with glowing stage presence.” She was awarded the first prize in the Papanasam Sivan competition held in 2008, and gave a solo concert under the auspices of Yuva Bharati in February 2009, as well as a very well-received solo performance in Hyderabad in December 2011. In 2009, Anjana presented her own group choreography at the annual Yuva Bharati ‘Kalpana’ concert. She has mentored several students towards their arangetrams. Lakshmi Venkatesan learned Bharatanatyam for over ten years from Mythili Kumar, and performed her arangetram in 2005. She has participated in several Abhinaya’s dance productions since her arangetram. Some of the notable productions she has danced in, are ‘Rivers- A mystical Journey’, ‘Prithvi-the Earth’ and the 30th anniversary performances in 2010. She has performed for various local community organizations and events, schools, and temples. She has been teaching classes for Abhinaya for over five years and regularly assists with coordinating and leading student performances at local community events. 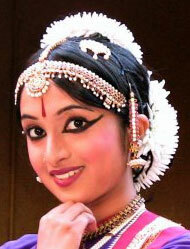 Gayatri Venkatesan learned Bharatanatyam for over ten years from Mythili Kumar, and performed her arangetram in 2009. She has participated in several Abhinaya’s dance productions since her arangetram, including Nritya Sangati,Natya Samarpan, and Sadhika. She is a student at San Jose State University and has been teaching classes for Abhinaya for over three years.